February 23rd, 2005: The publisher Universal Edition, Vienna, confirms the publication of our orchestral arrangement of "EIN NEUJAHRSHYMNUS". September 21st, 2005: Universal Edition now also confirms the publication of our orchestral arrangement of "BERGHYMNE". Early in 2004, I received a message from Prof. Wolfgang Bulla (Graz, Austria) who told me that most of the film music of the Austrian film "Cordula" (1950) consists of orchestral arrangements of non-orchestral works by Joseph Marx. According to the copy of the movie that I obtained thereupon, the film music had been arranged by Willy Schmidt-Gentner and Heinz Sandauer specifically for this film, i.e. they had orchestrated parts of a couple of Marx works. However, it was mainly the theme music at the beginning and during the final credits which attracted my attention. After several days of investigation, I realized that this music was Marx's choral work "Ein Neujahrshymnus" ("A New Year's Hymn", 1914; originally written for male choir and organ), presented in the movie in a gorgeous version for mixed choir and orchestra. As I learned later (from some letters exchanged between Marx and the arrangers in 1950), Marx authorized the orchestral arrangements of his works that were created for the movie. Some time later, I reported to the composer Stefan Esser about my find. He too was extremely enthusiastic about the wonderful film version of this work and spontaneously suggested that we should orchestrate it ourselves by using the original score of 1914 (written for male choir and organ). But beforehand, I wanted to find the scores and tapes that must have been used for the film in 1950. Therefor, I contacted a huge number of Austrian film institutes, archives, libraries and even the heirs of the movie makers and arrangers of the film music. Finally, I had to see that the complete material that was used for the film (including scores and tapes) is lost without a trace. On the other hand, I was able to find out that the arrangers had orchestrated only those parts of the work that are actually audible in the movie (and as mentioned before, the music samples on the movie's soundtrack are equivalent to only one fourth or fifth of the original score of 1914). 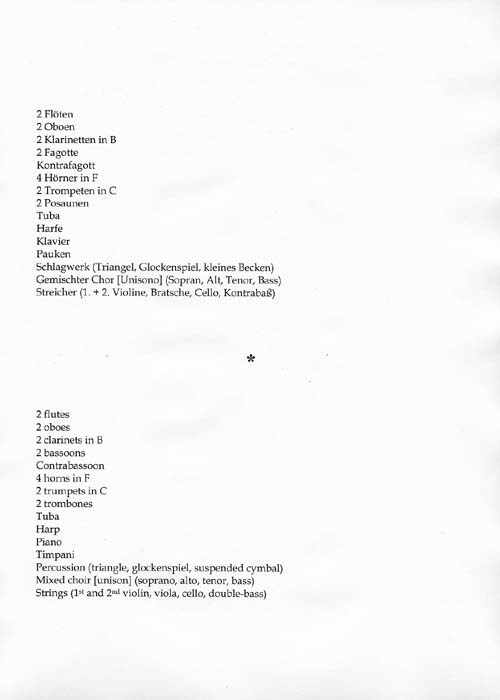 Important note: The arrangers of the film music version not only made severe cuts on the original score, they even splittet some of the few parts of the score which they used into fragments and pasted these fragments together in a totally different sequence than can be seen in Marx's original score. It was after this very discovery that Stefan Esser and I decided to completely and unchangedly arrange the original score for mixed choir and orchestra. First, in May 2004, we obtained the necessary permission from Universal Edition, Vienna, where the original score of 1914 is published. Then, Stefan Esser started the orchestration of the original score of 1914. I (the author of the website) began to join in some time later. In Summer/Autumn 2004, we spent a part of our spare time working on the score until, on November 26th, 2004, we considered the work finished. Our orchestration is loosely based on the fragmentary film soundtrack (as mentioned, the music audible in the movie represents only a small fraction of the complete original score of 1914). A live performance of our work will take approx. 10 minutes. To the best of my knowledge and belief and in my capacity as Marx biographer and expert on Marx's entire oeuvre, I can assure that our orchestration is the closest possible to what Marx would have created if he had orchestrated it himself. 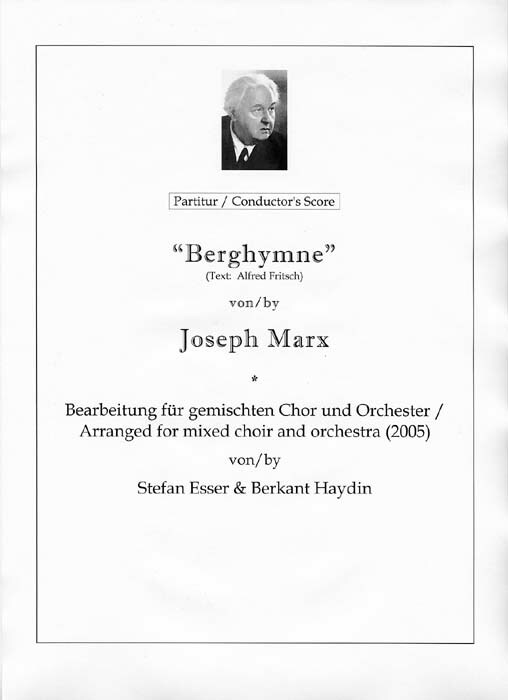 Early in January 2005, I ordered a copy of Marx's unpublished work "Berghymne" from the Austrian National Library, a work which previously had been listed in my Discography section as an "unfinished draft of a work for choir and orchestra"). Surprisingly, the score turned out to be a finished "Particell" (a reduced score), i.e. a kind of extended piano score including choral voices (unison) and a few basic orchestral voices. On the top of page 1 of the score, Marx had included the headline "Berghymne for choir and orchestra". Hence, Marx obviously wanted this piece to be worked out for choir and orchestra on a later occasion, and so he captured the essentials in this Particell score, but although his score already includes the outline, he never made the orchestration, perhaps due to lack of time. Also, aside from Marx's unpublished organ and piano pieces and his also unpublished five orchestral songs after Hugo Wolf, "Berghymne" is the only finished work among his unpublished manuscript scores. 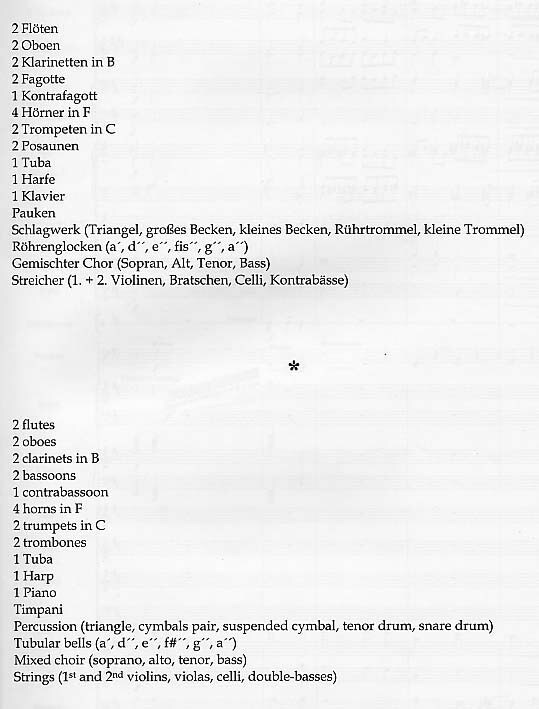 For these reasons, and since Stefan Esser and I had just completed the orchestration of "Ein Neujahrshymnus" (see above), we immediately knew that it was literally necessary to orchestrate "Berghymne", too. Our arrangement of "Berghymne" for mixed choir and orchestra was completed on March 5th, 2005. "Berghymne" is a very short piece but still amazingly symphonic why it absolutely deserves to be titled "Hymn". There's no need to mention that this unpublished work has never been performed. Unfortunately, it was impossible to trace the year of origin of Marx's Particell score. However, due to the stylistic resemblance to Marx's other choral works, we have to assume that he wrote it between 1910 and 1914 which is the period when all of his other choral works were composed. "Berghymne" is actually one of those rare curiosities of music history leaving behind some mysteries that will most likely remain unrevealed forever. Due to some obvious similarities, one can compare "Berghymne" to "Der Sturm" by Erich W. Korngold, which is another unique gem for mixed choir and orchestra: Both works are very short; both were written in the very same period; both remained unpublished and were never performed and never mentioned by the composer. It was the producer Miguel Kertsman (who is also producing ASV's "Complete Orchestral Music of Joseph Marx" series) who made possible world premiere recordings of "Der Sturm" and other Korngold works that are now available on four Korngold CDs produced by Mr. Kertsman for ASV. Since a performance of "Berghymne" will take only 3 minutes, the chances of being performed by itself are low. 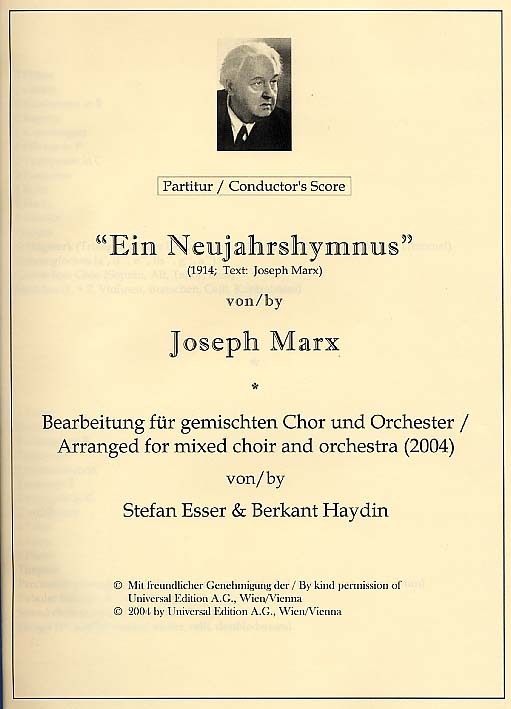 Fortunately, the compositional structures of "Berghymne" allowed us to use almost exactly the same instrumentation as for "Ein Neujahrshymnus", so that these two works can be performed or recorded successively without the necessity of adding or rearranging instruments or choir members between the two works (a live performance of "Ein Neujahrshymnus" and "Berghymne" performed successively would take approx. 15 minutes). Conductors, choirmasters, choir members, musicians and of course any other visitor of this website: I'm looking forward to reading your mail: Thank you!